Having an allergy to white, all-purpose flour means having an allergy to wheat. Most wheat allergies develop during the infant or toddler years, but children generally outgrow wheat allergies between the ages of 3 and 5. Allergies to all-purpose flour and other wheat products rarely develop in adulthood. If you suspect that you or a family member has an allergy to all-purpose flour, contact your doctor for an official diagnosis. All-purpose flour is a type of wheat flour. According to Oklahoma State University's Division of Agricultural Sciences and Natural Resources, kernels of wheat consist of the bran, endosperm and germ. A miller makes whole wheat flour by grinding the entire wheat kernel but makes all-purpose flour by grinding the endosperm. 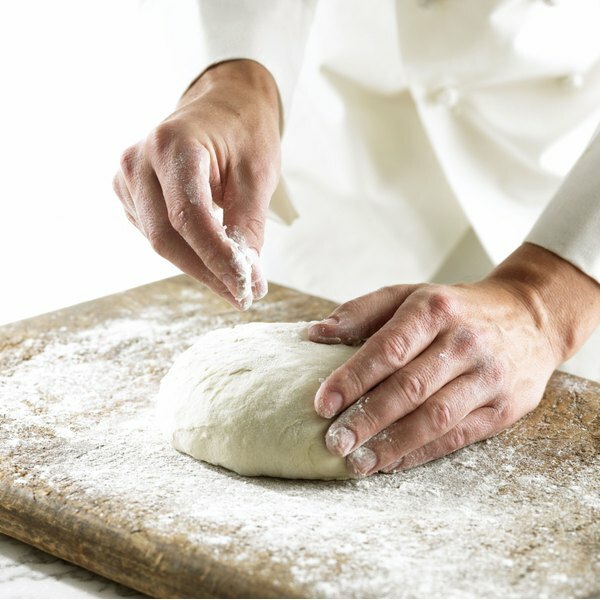 Other types of wheat flours, as listed by the Wheat Foods Council, include standard bread flour, self-rising flour, cake flour, pastry flour, gluten flour, semolina and farina. As MayoClinic.com explains, in individuals with a wheat allergy, the immune system mistakenly identifies a protein found in wheat as a threat and creates an antibody in response. Once the immune system develops this antibody, it has a reaction whenever you consume wheat. Most individuals with a wheat allergy develop symptoms within two hours of eating. Some people only experience exercise-induced symptoms that occur if they perform moderate to heavy exercise several hours after eating a wheat-based product. Others have "baker's asthma," an allergic reaction triggered by inhaling uncooked flour but not by consuming cooked wheat products. Celiac disease -- a sensitivity to the gluten protein found in wheat -- is not technically an allergy but still prevents individuals from consuming all-purpose and other wheat flours. The most common wheat allergy symptoms include irritation of the mouth, hives, abdominal pain, diarrhea, nausea, vomiting, nasal congestion and watery eyes. In severe cases, a wheat allergy may even trigger anaphylaxis, in which the patient experiences throat swelling, rapid pulse and severe difficulty breathing. Anaphylaxis is especially symptomatic of exercise-induced wheat allergy. Individuals with baker's asthma frequently experience hives and nasal symptoms. Celiac disease, on the other hand, primarily mimics the digestive symptoms associated with a true wheat allergy. If your doctor diagnoses you with a wheat allergy, avoid foods made with all-purpose flour or other wheat flours. Buy food labeled as "gluten free" or made using alternative flour types. For home baking purposes, switch to using an alternative non-wheat flour. According to the Lucile Packard Children's Hospital at Stanford, 1 cup of any wheat flour equals 1 cup rye flour or rye meal, 1 cup potato flour, 1-1/3 cup oat flour, 1/2 cup potato flour mixed with 1/2 cup rye flour or 5/8 cup rice flour mixed with 1/3 cup rye flour.